Another slow week around here, but I blame it on my chaotic life and NaNoWriMo. It never crossed my mind that I would write so much in only one week and half. So, in short, this has been my week: writing, reading and extra-reading for my thesis. And Blacklist thanks to Netflix - how did we live before Netflix?! 🌻 My life continued chaotic. 🌻 The cat strikes again. It's not nice to wake up in the middle of the night to find him breaking stuff. The only reason I don't get angry at him a lot is because he is deaf. 🌻 I've reached the 17,779 words on my NaNoWriMo project. Would you like me to share an excerpt? 🌻 EXCITING NEWS! I've become a physical books rep for Blaze Publishing [quick resume of all the books to be published by he publisher]. Can't wait to start received the books an share them on Instagram. Ps. : They are looking to epub reps, so take a look at it if you are interested. This week I finally shared my October's monthly recap. Almost two weeks have gone by since the October ended, but, as mentioned before, life has been too chaotic. Can I've a long and relaxing holiday? You can find my review of The Night Realm by Annette Marie as part of a blog tour. There is a giveaway (an amazon card gift) if you would like to participate. Last week, I may have not gone bankrupt, but this week was a different story. 🙈 My last orders from Book Depository arrived this week -although one of them was not really what I ordered. First, I received my copy of A Darker Shade of Magic collector's edition. 🎉 It's a beautiful edition. And, I still can't believe it's signed. I'll cherish this book with all my heart. Second, I received the Shadow and Bone Trilogy Box Set. I'll not complain since I did have plans to buy the new covers, but I ordered the old covers and received the news - I even received the old box with the new covers. It was very weird... This is something that has never happened to me before. Does anyone know where I can get the old covers? Because now I'm afraid of ordering them individually and also received the new covers. How was your week? Which books arrived at your bookshelf? Poor kitty. Sounds like he wants some lovin. I don't know how we lived before Netflix, lol. I started binge watching Marvel: Agents of Shield on there this week and was just thinking about how addicted to Netflix I really am. 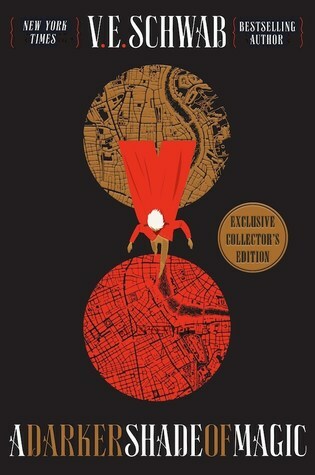 That signed collector's edition of ADSOM looks amazing. What a fantastic edition to your collection! You sound like you had a pretty good week, and I hope next week is just as good. Happy reading. Thanks for stopping by my Sunday Post. Poor kitty! But poor you, too. I remember a kitty I had when the kids were younger and being upset that she broke some things my kids made for me in school. Netflix is a great thing to have...and so are DVRs. I remember missing out on things before we had them. Thank you. I still can't believe I've written so much in such short time. :) I always try to glue everything he breaks, but a some thing are just beyond repair. Yes, how did I miss DVRs?! Congrats on the NaNo stuff. I could never write that much. I hope you have a good week and enjoy your new books! A darker Shade of Magic Looks gorgeous. Sounds like your NaNoWriMo project is going really well. Congrats! Congrats on NaNo, and have a great week. Sounds like you are doing great with NaNo - good job! Our cat gets annoying at the computer. Sorry yours is waking you at night. I don't order physical books anymore so I haven't had the cover problem. But I found Book Depository people helpful when I emailed them about an order for book wins that I sent. Hope this is a good week with Happy Reading! Thank you. :) I'm already used to it - it has been a long year of waking up at night with him making noise. The people working for Book Depository are very helpful indeed. Once, the books they sent me were damaged and they replaced them very fast. Congrats on writing so much and on becoming a rep! That is so cool. How did you, well, become their rep? :D how does one even do that? Hahah. If you are interested in being a rep for Blaze Publishing, you can visit their Instagram/Website. I know they are looking for new reps, but I'm not sure if the form has been already been shared (I think it will only be released in December). But if you want to, I can recommend you to them since they have been asking. I've four more cats and they don't create as much mayhem as Gizmo does. I truly believe the reason why he breaks so much stuff is because he can't listen. If he could, he would probably get scared with the crashing sound and wouldn't do it again. Congrats on your nano progress. That ADSOM edition is so pretty.